His name is Nick Abraham, but everyone calls him Coach Nick. 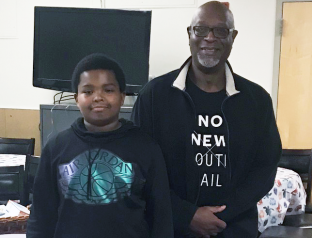 For more than 35 years, he’s been a health, fitness, strength and conditioning trainer in the Seattle-Tacoma area, and uses that platform to mentor local youth. Recently, Coach Nick worked with the 4C Coalition, one of our local mentoring partners. There he met and in January stared working with Diontrae, a sixth-grader at the time. In the beginning, Diontrae had severe anger issues at home and at school. His grades were well below average and he had a negative attitude toward life and himself. But he loved basketball and Coach Nick decided to spend a few days a week with him to workout at a local gym. At first there was little progress and little conversation, but eventually the relationship warmed and the friendship grew. By the end of the summer, Diontrae’s attitude and school attendance had improved dramatically. This year, his grades are all A’s and B’s. Best of of all, he has taken responsibility for his decisions and behavior. Several of Diontrae’s teachers remarked that he is a joy to have in class. Learn how you can become a mentor here and help a future Diontrae realize his full potential.